Carbon dioxide (CO2) extraction is a newer process which involves transforming the CO2 into a liquid solvent which can be used to extract the essence from plants. Also known as “hypercritical carbon dioxide extraction” this process provides the added benefit of avoiding any thermal degradation which is commonly associated with distilling at normal atmospheric pressure levels. The CO2 extraction process involves pumping highly pressurized carbon dioxide (CO2) into a large chamber or holding tank filled with plant matter. 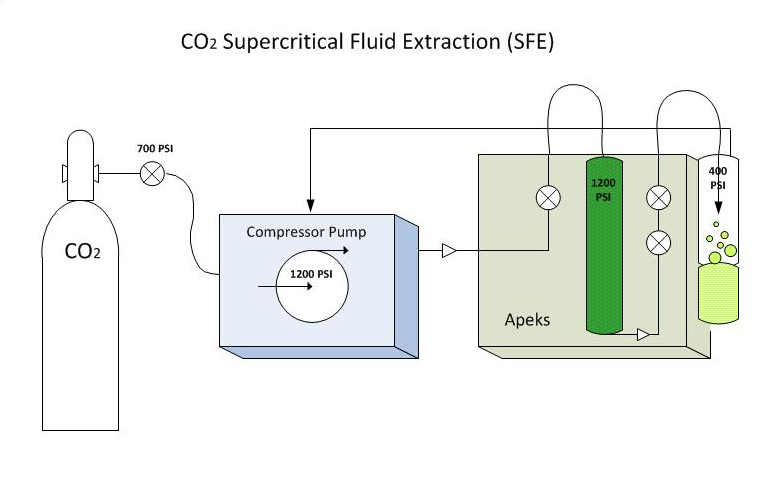 When the CO2 is sufficiently pressurized, it will become “supercritical” and will exhibit some of the characteristics of liquid CO2 while remaining in a gaseous state. The liquid properties of the supercritical CO2 allow it to act as a solvent which draws out the oils and other substances, such as pigment and resin, from the plant matter in the tank. Because the CO2 extracts created as a part of this process typically contain more elements from the plant than simply the essential oils, CO2 extraction is considered to deliver a result which is more akin to the original chemical makeup of the plant than essential oils which are extracted via steam extraction. With these process we can produce high quality hops extracts as well as essential oils such as our orange oil. CO2 extraction is rapidly becoming the standard process because it offers a variety of benefits which are not enjoyed as part of the traditional steam distillation process. Extracts retain more smells and colors. The low heat associated with the procedure, as well as the relatively nonreactive solvent created by the supercritical CO2, ensures that the essential oils extracted during a CO2 extraction more closely resemble the original plant in both smell and color. Shorter extraction periods. CO2 extraction takes significantly less time than traditional steam extractions. No harmful solvents. CO2 extraction is odorless and nontoxic, which eliminates the need for potentially dangerous solvents such as hexane which pollute the environment and can cause serious bodily harm. Longer lasting products. Essential oils extracted using this method have a longer shelf life and are more stable than oils extracted using steam or water. Learn more about CO2 extraction and our consulting services by contacting Extractz at (440) 367-8086.